Instead of beginning this article by listing all of the negative ways smoking impacts your health, like most tend to do, we’d like to introduce you to the positive changes that your body makes just 20 minutes after you’ve put down a cigarette for the first time in a long time. 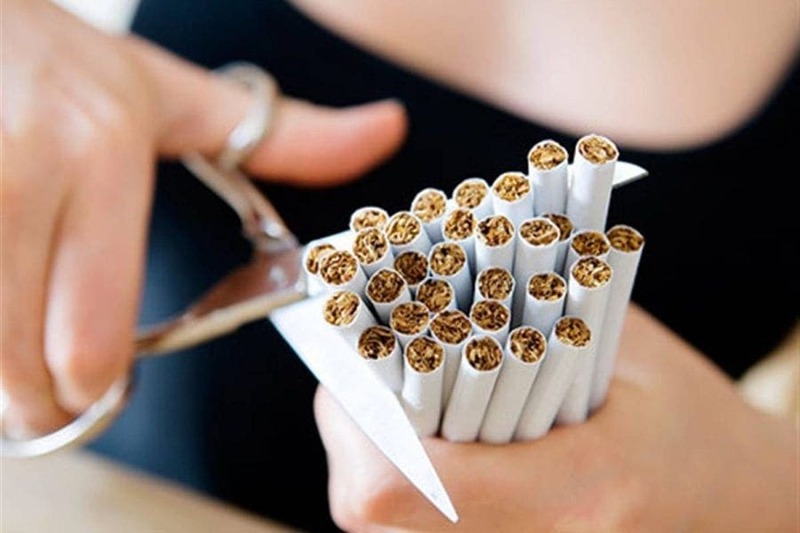 Reversing the health implications of smoking begins as soon as you decide to quit and the trick to ceasing such a dangerous habit is overcoming the hurdle of the first few weeks’ withdrawal symptoms. We understand that the nicotine cravings can shake you to the core, the possibility of considerable weight gain isn’t ideal, and the challenge to stop smoking with itself is stressful enough to antagonize your need for a cigarette. But, in the long run, you’re doing your body and your future the greatest service possible by overtaking the temporary struggle. Let us explain the benefits, both short and long term, that losing the nicotine has on your body. After the first 20 minutes of putting down that cigarette pack for good, your heart rate and blood pressure levels will steadily normalize. Another 8 hours later, you’ll start to experience withdrawals. 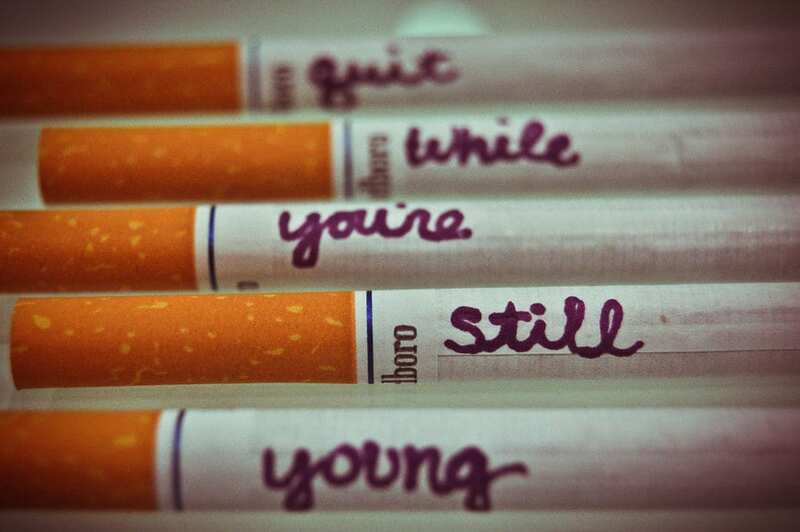 This is because any nicotine that was left polluting your bloodstream and lungs, has finally left your system. After 1 day, you’ll start to experience a severe level of withdrawal, which will induce your stress levels and increase your need to satisfy the nicotine craving. The first day of quitting is usually the hardest and while the next month surely won’t be easy, it will definitely be a downhill endeavor. In between the next 2-3 days, and as the remainder of nicotine in your system, you’ll notice a resurgence in two very crucial senses: taste and smell! One of the greatest (and most valuable) benefits of setting down the tobacco stick for good is your replenished smell of food and the flavor-bursting enhancement you’ll experience while you eat. After 3 days, there will be some serious cravings to overcome, we know you can do it! 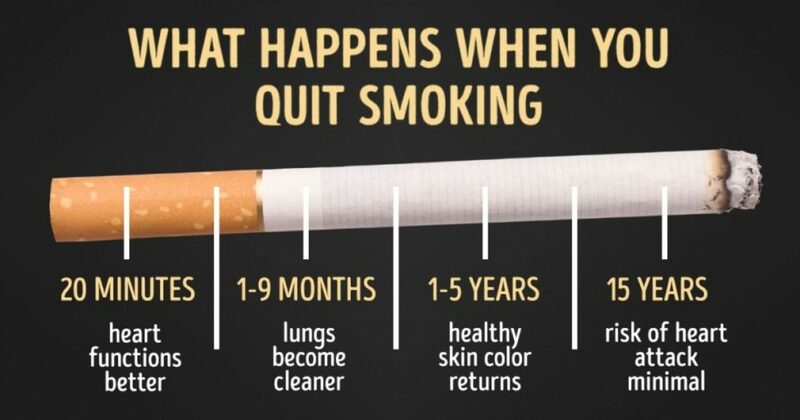 In between 2-3 weeks of quitting, your body will organically begin reversing the negative implications smoking used to plague your health with. Your increased heart rate and lung capacity will pleasantly surprise you, as well. Physical activity will no longer seem like a burden after 3 weeks of being cigarette free. Something special happens once you’ve been off of smoking for at least a month. Cilia, which are the microscopic hair-like structures on the lungs, will begin to repair themselves and your lungs will be able to fight infection and invasive bacteria that could cause detrimental damage. By the time you’ve reached the 9-month mark, you’ll be free of any and all withdrawal symptoms that were making you doubt your self-control. One year after you’ve stopped smoking, you have officially lowered your risk of heart disease by half! For those who make it the long haul and go 5 years without dragging on a cigarette, your risk of having a stroke is the same as a person’s who has never smoked a day in their lives. From here on out, it’s smooth sailing; at the 10-year mark, your chances of developing lung cancer are greatly reduced and the chances of experiencing heart disease (and its complications) are fairly non-existent. To quit smoking is no easy feat, by any means. It takes a strong desire and a certain amount of willpower to kick such an addictive habit. But, if you put things into perspective, your future is dramatically dependent upon whether or not you decide to take control of your relationship with the deadly substance. Giving up smoking will allow you to propel forward in your life with a strong set of lungs, a properly-pumping heart, and the opportunity to live past the average human being’s life expectancy.